In observance of the blessed month of Ramadan, Rayna Tours has introduced a special Iftar cruise to help you have the most cherished moments of devotedness with your dear ones.Offering the most authentic gastronomic specialties, it’s a reassuring choice for those with an intense appetite during Ramadan. Immerse yourself in the prized ambience of our elegantly refurbished wooden dhow which perfectly off set the Dubai Creek’s impressive charm and character. This one hour cruise will journey you through the heart of Old Dubai, giving you the ultimate chance to take in the views of souks, quaint quarters, traditional structures, and modern architectural marvels that line along the creek banks. As for the food served on board, the portions are immensely generous with a buffet style Iftar menu that artistically fuses traditional Asian taste with local Emirati flavors.Apart from premium dates and freshly cut fruits plus a variety of drinks, it consists of crisp savory starters and grilled specialties, alongside the most scrumptious main delights like Arabic Kabsa. Not alone these; be sure to save room for some lusciously gooey desserts. Prayer facility is arranged within the dhow and you can choose to dine and appreciate the unrestricted vistas from the partly open upper deck or even from the fully air-conditioned downstairs. 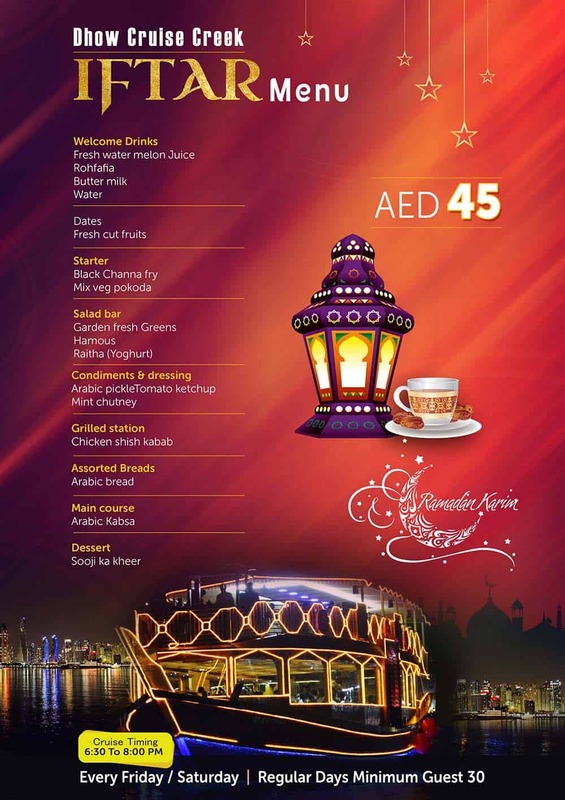 If you wish to get connected to the real essence of Ramadan in the most meaningful way while in Dubai, don’t delay to make a booking of our limited edition Iftar cruise. A wonderful arrangement made On Board to offer Prayers followed by a delicious Meal at the Iftar Party in the Holy month of Ramadan. The cruise will be operating only on Fridays and Saturdays. A minimum of 25 pax are required per Booking. Peaceful and worth visiting..Thank you Rayna tours! I had never been to an iftar party before and wanted to enjoy the spirit of the festival during Ramadan last year. Booked this tour for me and my wife and it was great. Not only we got to know about the tradition and culture associated with Ramadan, we were awarded with beautiful vistas of the Dubai Creek. Oh, and the food was so amazing. We still reminiscence about the delicious food we had at the party. Everyone should give this a try at least once. My family was just so delighted and happy..! Last year during Ramadan, I wanted to do something special for my family so that my mom and wife got some rest during the day while they were fasting. Arranged for an Iftar party for my family and friends of around 50 people through Rayna Tours. The fact that it was on a dhow cruise sailing along the Dubai Creek made it really interesting. All the arrangements done by Rayna were perfect. The buffet was great and the food was absolutely delicious. We had a great time onboard.